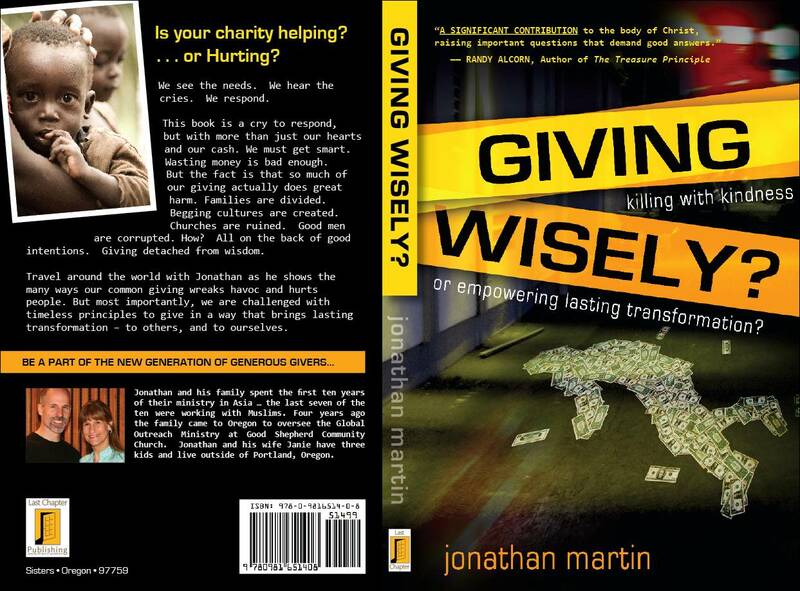 I bought a copy of your book, Giving Wisely, at Mission Connexion on Saturday and just finished it. I really liked the ideas you presented in RAISE and will use it personally and in our church. I was particularly interested in the chapter on child sponsorships since I have been doing some volunteer work for sponsorship agency. I think they are pretty good with respect to RAISE, but I am not real sure about the Equity part. I did have one question and that is if you distinguish between generous giving and sacrificial giving. Sacrifice by definition means: to give up something of value for the sake of something of greater value. So by that definition of these words, anytime we give, we are being generous in some sense and there is sacrifice. We give up something we could have - so that someone else might have. It is a matter of saying someone else and thier needs are more important than - whatever it was that we have given up. So what are we giving up? Would the poor mock us if they knew what it was we were giving up for their sake? I've heard some mock Bill Gates for giving up the right to have a 120,000 square foot home and instead opting for a comparatively modest 60,000 square foot home. We ask,”What kind of sacrifice is that?" Yet if he gave it up for the sake of saving Aids victims in Africa - it was indeed a sacrifice by definition. It was generous. And good for him and Melinda. But when most of us think of the word sacrifice - we think pain. Giving generously to the point of pain. Now that is sacrificial giving!! If it does not hurt, then it can’t rightfully be called a sacrifice. I do not think this is the right way to think of it. If we look to the teaching of Christ, I think we see a king of giving that is truly profound. A giving that is all too rare. It is found in Jesus example of the widow and her two cents. In this story, many people are giving. Nearly all give out of their surplus. One gives all she has to live on. This woman was already in pain and yet she still gave. Both sacrificed, but one was truly honored in the most profound way. What kind of giving is this? I think the bottom line in this story is this: One was forced to live by faith as a result of her gift, and the others were not. The woman had nothing left to live on but faith. Faith that somehow God would provide. And even if He did not - that was just fine. The others gave their ten percent and it was a huge amount. But the amount they had left to live on did not produce a dependence upon God to provide. In fact, it had potential to produce a warped kind of pride. By this example, how many of us Americans give to the point that it takes faith to live after our choice to give. Not many. Not often. We take our financial classes and figure out how we can plan to give our 2, 5, or 10 percent. We crunch the numbers and we make them work. This takes planning and that is good. And this planning may come as a result of obedience to God and that is indeed being faithful. But... the giving that Christ most honors is the giving that takes faith to live after the gift. How many of us do that? The most exciting giving I have ever done in my life came right after I was married and I gave money that I knew we did not have. It meant my wife and I would either go hungry, not pay the rent that was due in a few days, or she would have to drop out of school. But there was one other option: God would meet our need in a way we could not imagine. And we were compelled to give that 500 away - twice. God showed up with the exact amount we needed two times in a row – once through a 500 dollar retroactive raise (go figure) and another time by having a woman total an old car of ours and getting 500 dollar insurance check (and we could still drive the car). What fun to see God provide. What fun to live by faith. Instead of calling this sacrificial giving - perhaps we should call it “giving by faith”. Faith that God will meet my needs even though it does not compute on paper or fit into my budget. It is pretty sad that perhaps my best stories of living by this kind of faith come from 18 years ago. I am forced to ask myself the question: When have I given this way – this year? This month? This day? You see the woman who gave her last two cents was being really stupid humanly speaking. But she received the ultimate reward - the commendation of the King of Glory. Wow! So we need to plan to give generously and to sacrifice certain pleasure of this life to meet the needs of others. But Jesus asks us to take one step further. He calls us to step off of the solid ground our feet securely rest upon and out into the thin air where only He can catch us. He wants us to step out by faith and do what does not make common sense. These words ring in my ears - walk by faith, and not by sight. Giving by faith. I need more of it. In this economic time of uncertainty - we all need to start this kind of practice. It is truly when we take steps of this kind of faith that we see God show up in His power. Biblical sacrificial giving: We give up something of value: the feelings of financial security. We gain something of greater value: the reality of faith and the pleasure of seeing God show up. We come to the true knowledge that our God is our provider. He is our God – and not we ourselves. Thanks for sharing these thoughts with me, Jonathan. I really like the connection to faith. I am afraid an example that I could think of formyself was quite a few years ago also. I decided to do a search on sacrificial giving and found the points below from generousgiving.org. What is sacrificial giving, and why is it important? Sacrificial giving is the kind that is done at great personal cost to the giver. It is possible to give without suffering any loss<http://www.generousgiving.org/page.asp?sec=87&page=155> . Indeed, we do this all the time. When a family donates a bag of old clothes to theSalvation Army, or when a multibillionaire gives an impressive-sounding six-figure contribution, they feel no loss because it is in their best interest to discard those things anyway. Strictly speaking, in the words of author Randy Alcorn, this is not giving at all but "selective disposal".This kind of giving is fine (it is certainly better than throwing old clothes or money away), but there is nothing distinctively Christian about it. Even in the Old Testament, King David recognized this difference when heinsisted, "I will not sacrifice to the Lord my God burnt offerings that costme nothing" (2 Samuel 24:24). The one great biblical example of generosity is Jesus' gift of himself<http://www.generousgiving.org/page.asp?sec=1&page=43> to make atonement for sins, which was done at unimaginable cost to the giver (1 John 3:16).Obviously, our greatest sacrifices are not even in the same league with Jesus' unique sacrifice. But we Christians are imitators of our Lord, andfor that reason we give our very best, that which it pains us to lose<http://www.generousgiving.org/page.asp?sec=87&page=155> . How can wealthy people give sacrificially? With great difficulty. Sacrificial giving is the kind that is done at greatpersonal cost to the giver. But a wealthy person, by definition, is someone who has so much money that he can weather losses with ease. The very function of wealth is to shield its owner so that it is hard for him to do anything at great personal cost. Indeed, for this very reason Jesus says,"How hard it is for the rich to enter the kingdom of God<http://www.generousgiving.org/page.asp?sec=43&page=587> " (Luke 18:24). It is not that the poor are more righteous in God's sight than the rich; no, weare all equally hopeless<http://www.generousgiving.org/page.asp?sec=1&page=43> (Romans 3:10). It is just that the rich are more likely to try to get along without God's help.The upshot is that a wealthy person, in order to reach the point of sacrifice, must give a much larger amount than a poor person would.Christian generosity is certainly more complex than any particular dollar amount or percentage rate. But practically speaking, if a wealthy Christian wants to begin giving sacrificially, he must sit down and calculate a number large enough that it will cut noticeably (even painfully) into his standard of living, and start giving at that level. For those who need help determining that number, missiologist Ralph Winter offers this suggestion:"Deliberately and decisively adopt a missionary support level as [your]standard of living and [your] basis of lifestyle regardless of income." If this "wartime lifestyle" seems hopelessly out of reach<http://www.generousgiving.org/page.asp?sec=43&page=412> , consider what Jesus says to the rich: "What is impossible with men is possible with God"(Luke 18:27). I like the "selective disposal". I like that term for a truly non-sacrificial giving. We American Christians do a lot of this kind of giving. More than anything, I know God wants to produce dependence upon him, and when our choice to give sacrificially pushes us to him - we are in the ballpark. Perhaps one of the greatest sacrifices we American Christians so often fail to make - is giving of our time. And it this commodity that is the most valuable in the kingdom of God. This is a sacrifice that cuts into every lifestyle. I still am convinced that such giving doesn't "painfully cut into our lifestlye" like is suggested above, but it actually frees us from the painful tumor of "self-sufficiency".